Hey, everybody. Welcome back to another episode of "The Taste." 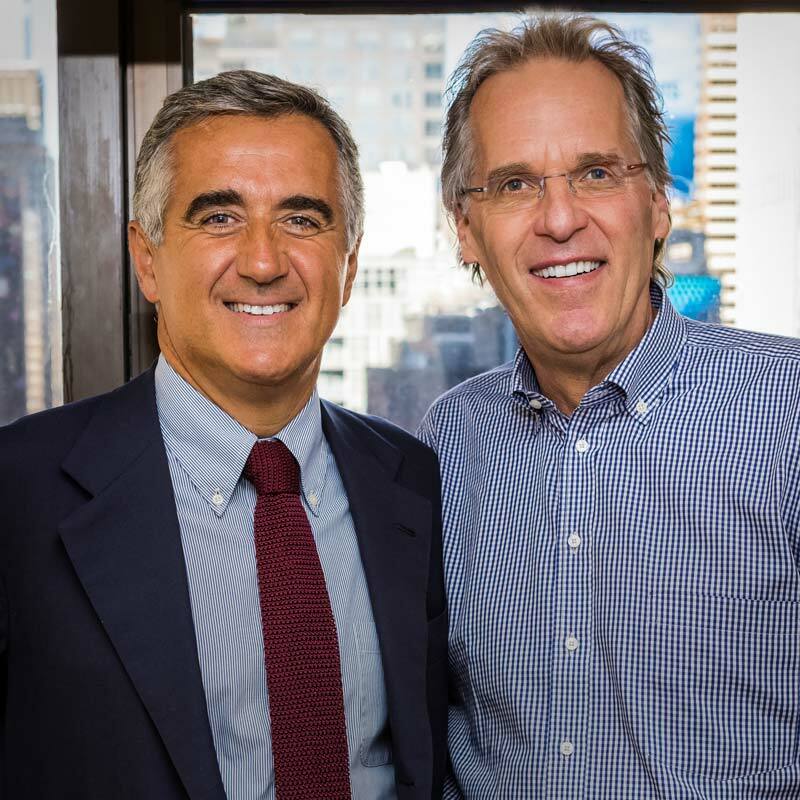 We are still in New York doing our New York series and, uh, we have a long-time friend of mine, Giovanni Manetti from Fontodi winery in the heart of Chianti in Tuscany, Italy. Welcome, Giovanni. Thank you. Thank you, Doug and hello to everybody and thank you for having me. Ow, it's great to see you. And, uh, as always, uh, with folks I know I have a little story to tell. It was back in 2003, the summer of 2003, which I think was the hottest year in Italy. On record. And my dad was turning 80 years old, so he decided to take his adult children to Italy. To Tuscany for a week, and we stayed in the, uh, your guest house at Fontodi. Which is a beautiful villa, if you will. And we had a wonderful time. We traveled around and ate great food and drank great sangiovese, which only cost 15 Euros. I mean, it showed me what real true sangiovese's all about. But, we had a chance to meet, oh, I met, um, Giampaolo Motta at La Massa, whose a long-time friend and a character, your neighbor. But, uh, one afternoon Giovanni hosted my family, myself and, uh, tasted all his wines and toured his winery and it's just beautiful. And ever since then, we've, well we've became great friends and we see each other once or twice a year, usually on the road selling wine. And the thing that's unique and I, I love about Giovanni and my relationship is, it always goes like this: we haven't seen each other maybe eight, or nine, or ten months, or a year and the first comment is, "How's your family?" We exchange that. And then, the next comment is, we both look each other in the eye and says, "How's the harvest this year? (laughs) How are the grapes? And is it a hot year or cold year? How do the wines look?" And, and we just, he just walked in the door here ten minutes ago and, um, it's, we, uh, said, you know, we're still picking. He says, "We're all done." So, um, he's relaxing this trip and I'm still thinking about grapes back home. It, it is the least of our priorities. Family first, then the wine, then selling the wine. Right. So, um, great to have you here and I, just kind of curious, you know, we've been friends for a long time, but I'm curious about Fontodi and your family, going back, your parents, siblings. Where were you raised? What was your, what were your parents up to in the beginning? Our hands. So, my father acquired Fontodi in 1968. And uh, he did that just, uh, you know, as a hobby. Yeah. Because we are, we are from that region. We are from the Chianti region. And, we have another activity in the family. We produce terra cotta tiles. And now, even uh, for us, the wine. And since 1650s. So, you know, a long time. 1650 was the, the terra cotta business? Yeah, yeah, yeah. It started. But, my father Dino, was very passionate about wines. To, to Fontodi, to Panzano that is in the middle of Chianti area, in the middle of the countryside, in the middle of nowhere at that time. So, it was a shock, you know, because I was 16 years old. Yeah. I fell in love, I fell in love with the, with the countryside, with the beauty of the place, with the viticulture, with the, you know, with everything. And, uh, I started to be involved at that time and, uh, year by year, you know, taking more and more responsibility. And since that time, that is all my life. That's amazing. That's great. So, you grew up in Florence. So, grade school, high school. What you, did sports in high school? And college? Or, extra? Music? Or anything like that? Or? I was, uh, also a motorcyclist. Do you, did you race them? Off-road? Good, cause they don't go quite as fast. Off-road. (laughs). But, um, that was my sport. And even skiing or, um, playing tennis. You're in good shape, but the motorcycle thing, that can be a little dangerous, yeah? How many, any, any broken bones? No, no, no, no. Thanks God, no, no no. And, uh, but now I'm, uh, you know, 55. I'm a cyclist. So, I turned to bicycles. One more thing in common. Good. So, we need to get together and go, go for a ride. And the, two of them are that a, really the most beautiful one is on the Dolomites. That is, uh, the Maratone del la Dolomiti. It's beautiful in the first, uh, week of July. And the other one I just did is Eroica. It's a bike race in the Chianti Classico region with old bikes. Yeah. Old clothes. So, very heavy, woolen (laughs) the shirt and the old bikes, very heavy, too. And, uh, all on the dirty road. It is amazing, amazing, amazing. It's last edition one month ago, there were 8,000 cyclists from all over the world. So it, huge, huge event. Now, do you still ride, do you, will you ride in that, also? The main problem is that every year in the middle of the harvest time. So, so no time to do, to do exercise. No train, no time to train. I understand. Yeah. Um, now I've grown to, um, I just like to go out and ride. I ride by myself. It's nice. And sometimes I ride with Elias, my, our winemaker. We ride together. That's, that's fun. You know, we have, we have enough pressure and stress at work. So, riding the bikes in the country in Napa's just a little relaxing for us. To concentrate, uh, you know, your thoughts. Good. I'm going to remember that. I'm going to use that one. Because sometimes I have those issues. Yeah. So, I'll go for a nice long ride. Um, and you mentioned the terra cotta. Is it true that, so from 1650, that's three or four hundred years. That's a long, long time. And of it, it's a family business. Family business. Always in the same place. Uh, the same products. And generation by generation. And now, my brother Marco is running that business. In both companies. Is it true some of the terra cotta's on, on the top of the Duomo? I mean, Giovanni, that's that's really neat. Yeah, it's a great product and typical of the area and all the main buildings in Florence, in all the churches and museums, uh, you know, they are made with our terra cotta tiles. Yeah, yeah. It's a big pleasure. It's special soils and clays that you use? Yeah. It's the same clay that we have in the vineyards. So, it's a, it's a galestro clay. Galestro is a, is a Tuscan word meaning calcareous clay schist. That is, uh, great to make wine. Especially for sangiovese, but also to make beautiful tiles and since, uh, 10 years, also amphoras. Amphoras for wines. So, now we have the possibility to, you know, to combine the two activity of the family and this, something so exciting. That is neat. So, you're making the amphoras, which are, how large are they? The most used is the, the most produced is, uh, 500 liters. Like in a wooden barrel. Like in a barrel. Yeah. You don't get any clay taste? Or, anything like that? No, no, no, no, no. Absolutely. So, neutral. Yeah, yeah. And, uh, we are still experimenting with different varieties, different wines that we make. But it's something very exciting. That's neat. Anybody else doing it? Any wine in Napa Valley doing it? I would like to let you have one of them to try. I'd like to. I'd like to. And I'll, I'll pay good money for it. And, I heard it takes, doesn't it take quite a long time to make one of them? It takes, uh, it takes, yeah, it takes more than one month to make one. That, uh, two people, two artisans, that they, they make amphora. So, it's a long process. It's all made by my, by hand. So, it's very artisanal. And the, and probably the origin of wine was connected with the amphoras, you know? Eh, in Caucasus, so in Georgia or Armenia. They, they just found recently, amphoras with DNA wine, uh, dated the 8,000 years ago. So, much more before the Romans or the Greeks or the Etruscans. It's, uh, something amazing, you know? Yeah. And probably the origin of wine was there. Yeah. It has to be. In the wine world. I'm just a bambina, bambino. Um, hey quickly, just a little background on Chianti. Cause a lot of our folks might not be, be too familiar. So, Tuscany's actually a state. A region. And then Chianti is a region within Tuscany. The Chianti Classico region is, uh, in the center part of Tuscany between Florence on the north and Siena on the south. So, it's uh, the wine region in between. And we are located in Panzano. It's a small village halfway between the two cities. And in the middle of the Chianti Classico hills. So, the Chianti Classico is the name of the appellation. The one with the black rooster. So, the, every bottle has a black rooster as a symbol of the territory and a symbol of, uh, the appellation. Got it. And the main grape is sangiovese. True story. On that trip I mentioned earlier, with dad. At that time, we were making a sangiovese blend. Sangiovese-cabernet blend called Firebreak. And it, the, the origin and genesis of that was my father. Just like your father, traveled to Italy years before. In the late 80s with a couple of our New York importers who were connected with the Italian, importing wines. And he fell in, my father fell in love with Tignanello, and Antinori’s blend of sangiovese and cabernet. So, he came back and said to Elias and me, "Fellas, I want to make sangiovese." And so, he's the boss, so we did it. And we made a wine called Firebreak. Um, the grapes were planted on a hill that was a natural fire break for my folk's home. So we were making fire break, um, sangiovese, a little bit of cab. 10% to 20% cab. And it was a tough grape to grow and it was a tough wine to make And it was, the learning curve was really steep. And so, we'd been making it for eight or nine, ten years and then we took this trip to Panzano and your, your home. And, like I said, we're drinking, for seven days, we're drinking, Euros, sangiovese's that cost 15, 20 Euros that were just fantastic. And I realized, oh, my gosh, this is the place to grow these grapes and make this wine. Not Napa Valley. So, I went back, walked into Elias's office, our winemaker, and I said, "Elias, we're done making sangiovese." And you know what he did? He said, "That's the best news I've heard all day." I said, "Why is that?" He goes, "Because Doug, you know, it's the toughest grape to grow." For us in Napa, it was incredibly difficult to grow that grape and to tame it and also to make the wine. The wine was tough. You know. It's high acid and really tannic and we were having a tough time with it. So, we stopped making sangiovese and we've been happy about that ever since. And, uh, at the moment, 95% of all the property's planted with sangiovese, so, and all our best wines are made with sangiovese. So, that's where I think we're all heading for worldwide is focusing on the best grapes that do, you know, best varieties that do the best in each one's particular region. I think even, even the market is asking more and more that we specialize in a particular variety. In what we are doing better, you know? We have to focus on, uh, what is our best product. And I think that is the future. I think, I think you're right. So, getting back to Fontodi and your sangiovese, you are in a gorgeous spot. I saw it, because every morning I woke up and had my espresso looking over the vineyards. I got to know your vineyard guy really well cause I was always up early cause of the time change. So, I'd be out there drinking coffee and your vineyard guy, you know, was out there doing things in June and July that we do in Napa. So we, he didn't speak English. I don't speak Italian. But we got, we kind of, you know, "Oh, yeah. It's that time. We're leafing now. We're suckering. Whatever.” But, the region, I think it's, it's, it's got a name. Help me? It's conca, conca de ora? Conca d'Oro. Conca d'Oro. Yeah. Which means basin of sun? Or, basin of gold? Yeah. It's a, it's like a, you know, a golden shell. A golden bowl. It is the month of quality, I used to say. That's a good, that's a good line. September's the month of quality. Warm days and cool nights. Of the difference. Was 1 degree at night and 30 at the, during the day as the maximum temperature. It swung 29 degrees in one day. It's a, it's such a special spot and the, I can totally relate to the south and west facing slopes, because that's what we have at our place, as you and I've talked before. And our best cabernet, hillside select, comes from those south and southwest facing slopes. And it's, it's just beautiful. It’s a question of terroir, territory. Terroir. And, you know, don't you find that your best wines are the easiest ones. Our best come from our best grapes and they're the easiest wines to make. You're right. You're right. You're right. It's just which, nature's taking care of it. Yeah, yeah, yeah. But, uh, you know, we have to assist nature to give birth to the wine. But it's not easy, you know, at the end of the harvest I'm tired. I don't know you, but I'm very tired. Well, I, I used to be totally tired. Physically and mentally. Just, yeah, it's, um, you don't realize until it's kind of done and it's just, whew. In our, we have, in both of ours, we have gray hair, and they come from that (laughs). I always wondered where it came from because, you know, just, I, I saw some pictures of me just like seven, eight years ago and there's no gray hair. So. And we've had pretty normal harvests, so I don't know what happened. Um, but talking about your vineyards, which um, it's, it's 70, 70 hectares? Something like that? No, no. They're a little bit more. We have 90. Yeah. We are growing little by little, uh, when it's possible to buy some more land, but only on the borders. So, to my neighbors, uh, I do that because it's a, I think it's a, it's a good investment. And so, when your dad bought it, I did a little research. It was uh, I think apparently, really run down. Yeah, yeah, yeah. It was, everything was to be restored and replanted and we still have uh, just one parcel that has been planted before my dad uh, acquired. Uh, but all the rest has been planted, replanted after that. Well, and I, I found that your father had a name for the place when he found it. He called it, bay, you're going to make me pronounce it. I'll do it. Bella Addormentata. Now you, you need to say that. See it hurts. So, that could, uh, uh ... beautiful girl. It was uh, sleeping. Yeah. Sleeping Beauty. Like the novel and the, so he had to invest a lot of money and time. Especially time and energies to awake the girl, you know. I love it. And that was his hobby because he was running the terra cotta business full time, which sounds like a big, big business. Yes, but, uh, you know, it's a, his passion was wine. So, he did a lot of sacrifices to do that and I have to thank my dad for the rest of my life for, for, because he was able to transfer his passion for wine to me. You know? And uh, that is not easy. Now I have children. I have two children and I try to do the same and this is not easy. It's not easy. But uh I do my best to do that, to do again. They understand you come again. Emulate that type of passion. I think that you, you are right. Completely right. And if I remember, what my father used to say, he used to say, I don't have to tell you something, try to see what I'm doing, I believe in the culture of example. He used to say. Cultura de examplio. You know. I like that. Cultura de examplio. And it works. I think it works, you know, so more than words and, talking and talking, you know, I think it's much better to do things. And uh, let your children see what you're doing. Like, I've, I've, it reminds me of my eldest daughter. Cause I'm a, I'm a list guy. And now the list is on the phone, but it used to be on a piece of paper in my pocket. And, I realized my father, who is 94, he's still a list guy. He's still got his list in his shirt pocket. And, Katy, who's my oldest, you know, a few years ago, she's in her mid-twenties and she, she called me, we were somewhere, she started to laugh, she goes, " Oh my gosh." I said, "What?" She goes, "I've become a list person." I said, "What do you mean?" She goes, "Look dad, I've got lists just like you always had." (laughs). I thought that was pretty funny. Um, so, your dad's got the terra cotta business. He's got this winery that's becoming bigger and serious. How did he handle both? I mean he was working nights. He was working weekends. But then, you and your brother, as you got older ... what happened? Cause your brother runs the terra cotta business. Yeah, but at that time, we used to work together. When we are students, you know, at the university. So, quite busy with university. He is three years older than me. And we were at the University of Florence of Economy and Business, you know, those things. So we were both studying and working the same time. And it was, you know, quite hard. But, I would do the same if I had the possibility to go back. I would do precisely the same. Because it was so, so exciting. And we started from zero. I, uh, I remember that we used to, to drive to, to the university with our van full of wine and uh ... at the end of the classes in the afternoon, we used to do deliveries. Yes. The same day. So, it was a, it was very hard. Very tough. And when uh, when I tell this story to my children, they don't believe me. They say, no, you're joking. You're joking. But it was true. So, you'd get up in the morning and load the van. Load the van. Load the van with wine. Drive to school, go to class and after class you'd make deliveries. That's a wines, like a wine, I'm so successful and it's very, exciting, you know, to travel all around the world receiving a lot of success, and a lot of people are, you know, they want to shake our hands and see us and talk us, but at the, at the beginning it was, was very different. And you, and you don't know if you're going to succeed. You don't know if you're going to make it. Absolutely. Yeah. You have to take a lot of risk and, uh, do sacrifices, you know? Without sacrifice, there is no success, I think. And uh, and I think that is a good example also for, for the new generations, you know, so. Why don't, why don't I come take your kids out for dinner and I'll have a chat with them. And you can take my kids out for dinner and have a chat with them. Because like, they'll, they'll listen to you more than they're going to listen to me. So um your first wine maker was Franco? Franco been amazing. He's still with me. Yeah. Yes, yes, yes. We started together in 1979 and I consider him my mentor. Because uh, you know, my knowledge about wine at that time was close to zero. With wine culture to me, but just to teach me. And I really, I really appreciated that. And uh, we are close friends and he's, he's still is my consultant and I don't want to have any other people, any other person than him. That's great. That's great. And I, I skipped ahead because you and your brother delivering wine. So, after school, coming back to that. You both were working in both businesses? Or, how did that work? At the beginning, uh, you know, for 10 years, 79-89, we were together. And then, after, you know, graduation I remember that night my father, after a beautiful dinner, you know, he asked that okay, sit on, in the chair and I have to tell you something. Okay. What's, you know? What's, what's, what's he going to say? Say, yeah. I need one of you joining me in the, the terra cotta business and but both of us we are very passionate about wine. We wanted to make wine, both Marco and I. So we, we made a deal. And the deal was Marco was saying me, "Okay. I'm the older. So, I sacrifice myself and I will join ..."
"I will join my, my, our dad to do the terra cotta business, but, but promise me every three years, we're going to switch." We never did. (laughs). You promised. And so, how's that worked out? Is he? Is there any resentment on Marco's part? No. After three years, you go deeper and deeper in a, in a specific business and a specific activity. So, it couldn't work. But we are co-owner. So, he's, he's, he's so happy and proud of the success of Fontodi wines. And one of his children is, uh, works with me in the company, so we are so close. We, we live in two different houses that are, you know, 500 meters far each other. So, we are, we are, it's like a large family, you know. That's great. Well, you know your father, did a really, really great job raising you two guys. Because, um, you know that doesn't happen too often. That's pretty cool. Okay, so, you make a wine that I just adore and I love and I want to hear the story about it and it's called Flaccianello. Could you tell me about that one? And the history and the origin? Yeah, yeah. The first vintage was in 1981. And the, at that time, you know, end of the ‘70s, there was a huge crisis in the Chianti Classico appellation. Because there was a too much production. And the demand was poor. And the main reason why was the rules. The wrong rules for production. And help me. What were the rules before? Was? It was? Yeah. Before. At that time, uh, we, we had to, to make Chianti Classico wine blending sangiovese. It was the majority. 75% with 20% of white grapes. And the heading white grapes, white must, the sangiovese was being, uh, diluting. Well that was and, but that was the rule. You had to do 75 sangiovese, 25 percent white grapes. Yeah. 15-20 white grapes and the rest is canaiolo, another poor red variety. And if you didn't do that, you couldn't call it Chianti. Yeah. And with that recipe, it was really impossible to make outstanding wines. Only one year in a decade, you know. Well, of course, because you're diluting this beautiful red sangiovese with 15-20% white wine. You're just, you just diluted it. It's like adding water almost. That was a recipe made in, you know, in the former century, but just for early consumption wine. And so, but the wines at the time were not capable to compete with the best red wines from all over the world, you know? This was the birth of the super Tuscans. Yeah, Flaccianello belongs to that movement. And uh, it was a sort of revolution. You know? Because uh, Antinori with Tignanello, and Paolo de Marchi with Cepparello, and Flaccianello, they were all wines born in the Chianti Classico region. Did you? I'm going to interrupt. Did you guys talk to each other? You were doing it separately? But it, and knowing that you couldn't call it Chianti Classico. Get. Yeah. And getting out from the appellation, labeling our best wine as a vino la tavola, so the lowest category of the pyramid. We were so successful. Yeah, yeah. So, creating a sort of paradox. And the paradox was the best wines of the region under the, the lowest, in the lowest category of the region. Are the lowest category. The best wines. That, how did you? Well, I totally get this. Because if you're into quality, you're going to make the best wine you can, but because of these restrictions, it's to be labeled table wine. But, how did you get the word out to people? Did you? You probably traveled and told the story? Marketed? Because how the? Oh, tell me? How? Why was? They demonstrated. They showed the real potential of the region for quality wines. For high quality wines. And the, a few years after, in fact, in 1984, the production rules changed and the, they reduced the amount of white grapes to 2% that was meaning almost zero. And the, so they realized that that was the way. That was the direction to follow. And so they played a very important role for, for the success. For the success, well the success with quality of. And now it's a world-class region, where when you started out, it wasn't. Yeah, but, believe me, it was a sort of revolution. So, reacting, a reaction against the stupid rules. Did you have people, whoever where the rulemakers, were they calling you up and saying how can you do this? You can't do this? And the funny story that uh, I've been just appointed as president of the consortio. I read that last week. Yes, your now, hang on, it's in my notes somewhere. A few weeks ago, you're the chairman of the Consortio Vino Chianti Classico. Now you're the leader of, the head dog. I remember growing up and at Davis Chianti was, we all thought Chianti was the straw basket and all that. Yeah. With a candle on top. Yeah. With a candle on top. So, look what you've seen in 30 or 40 years. That's cool. You'll do great. Darn it if, now I've got more competition from you. Now that you're in charge, Chianti's going to be, you know, we'll be fighting shelf space with Napa and Chianti. That's okay. It's a friendly, friendly rivalry. And you've got another great wine which I'm not that familiar with, but I'm curious about it. Vigna del Sorbo. Can you tell me about that one? Vigna del Sorbo it is a, you're always being a Chianti Classico. So, because it was born in 1985. So, one year after the change of the rules. And Vigna del Sorbo is the name of the vineyards. So, it is a single vineyard wine. And the, the Vigna del Sorbo is really one of my best, you know, site. Vigna that I have in my property with beautiful full southern exposure. Very, very rocky soil. A combination between conca clay schist and limestone. Together they are like layers. And so, there is a, and also the age of the vines makes a difference. So, that vineyard is the oldest that I have. 50, 55 years old. And so it's a special land uh, great complexity and at the beginning it used to have a little bit of cabernet sauvignon in the blend. (laughs). Similar to Firebreak. So, 90 sangiovese, plus 10 cabernet sauvignon. But, in 2012, I decided to, to pull the cabernet vines. And uh, so after 2012, is a 100% sangiovese. That's like me pulling my sangiovese vines. I did the opposite. I pulled the cabernet vine. Same story. Well, you know when we pulled our sangiovese, everybody said, "Well, what did you replace it with?" I said, "Well, it was this wonderful hillside where we were growing it. I put cabernet in it." And guess what? It goes in the Hillside Select. Which is like, that's our best wine. So, it was a smart move. Sometimes I think in the interest of trying new things, we can kind of get, outthink ourselves a little bit. Where sometimes maybe we should just kind of stick to what we do and do it really well. Um, so tell me, so you've got those two wines and uh, then you have a Chianti Classico. Yeah. The Fontodi Chianti Classico, it is like uh, the business card of uh, of Fontodi. The most widespread. I see that. See that around. It's those three and is there more? Yeah. I make a white wine. Very small production. Made with sauvignon blanc, 100%. That is the one where I already use some amphoras to, to ferment the white must. Fermenting sauvignon blanc in the amphoras. Okay. Yeah. 20-30% every year is fermented in amphora. Minerality. Yeah, I can see that. Yeah, a good, like a chalky finish. I like that. I like it. I think it works a lot. And uh, I'm trying to increase that percentage every year. And this I still make a very small production of pinot, pinot noir. Only a few, you know, 3,000, 4,000 bottles. And the, also syrah. Yeah, yeah. The same. Very small. But what about your Vin Santo? Yes. Vin Santo. Vin Santo. You've got to tell me again how you make that, because Vin Santo. Everybody? Does everybody make a Vin Santo in Italy? Just about? And they put on somewhere to let them dry. They dry and they shrivel. Yeah. Even a, even a small, uh, small quantity. Like, it's almost, almost like raisins. Not quite. After a few months, they press and then, we press. And we put the must in a very small barrel. We call caratelli. And we seal the barrel and we open only after seven, eight years, depending on your, your style. So it is, it is a sweet wine with a nice you know, oxidized bouquet. It's delicious. We had it at your winery. You pulled that out and said, you know, we really don't make much of this and we don't serve it here at the winery and we're all like, oh no. We just fell in love with it. It's delicious. It's a, it's a wine that belongs to our deep, you know, traditions. And it belongs to our culture. So, we have to make it. It's a moral duty, you know, to make that wine. It's a, it's a moral ... do you do olive oil, too? Oh that ... so get right after picking grapes, you go to, you're going to olives. Yeah. The, the end of October we, we start to, to pick the olives all by hand. So, it takes a month. To pick all of them. It's, it's a great product. You know, we use olive oil on everything. You know. So, in, uh, in Tuscany, we have a specific food culture. So, we don't use any butter or cream or milk, because we have the olive oil. So, also, also we make cakes with olive oil. I'm assuming all your wines are exported. Is the olive oil exported also? And the more and more restaurants, you know, buying that olive oil because it's a great product to, to do, you know, to finish. It's a great, great product of our territory. Yes. You've got terra cotta, you've got fantastic wines, you've got olive oil. Is there anything else I'm missing? Oh, that's, oh gosh, that's right. Yeah. We have chianina cows. The chia, pronounce that again for me? Chia? And you, so you have a herd of them. Or a bunch. 55. That's a lot. I'd call that a herd. And they're part of your organic and bio-dynamic vineyard practices. Yeah, Yes. Because one of the main principle that I apply is the, is the, of the bio-dynamic uh, agriculture, is the self-sufficiency. So, trying to maximize internal resources, avoiding external inputs and so, and uh, the cows, they play a very important role because they, they produce the steaks and the meat for the family and for the crazy butcher that lives in my, my village. Dario. (laughs). Does Dario? Does Dario get some of your meat? There's a crazy. I'm sorry. We have to take a moment. There's a crazy butcher. He's not crazy. He's a fun-loving man. Um, Dario? Dario? Yeah. He's a poet. He's a singer. He's a great character. And a great butcher. He's a character and if you go to Panzano, you've got to go see Dario. So, Dario gets some of your meat. What I need to, to make the compost and that is my fertilizer, you know, so I try to underline more and more the, they terroir flavors. So, you're, you're farm slash farms are, it's all self-sufficient. Every part of the farm, of the system, has a double relationship with the rest. You know? So, I feed the cows with the hay and grass and barley that I grow in the middle of the rows in the vineyards. And they give us back the manure, you know, so it's like a circle. Well, yeah. You paid attention to it and took a step back in time. When, when I was a child, there, there were, you know, thousands of cows in the Chianti region. And then in the 70s, because the goal at the time was production. Increase of production. Reduction of the costs. They disappeared in a, in a very, very, in a short time. And I reintroduced them, you know 18 years ago. And I'm so proud of that. That's neat. You know, I'm overdue. Because I haven't seen you since uh, it's been over 10 years since I was there. Yeah, Yeah, Yeah. They're beautiful. They're so nice. Be come back. I want, I want the full tour this time. So, how many kids do you have? You've got? Marguerita, my daughter, she's 25. And then, Bernardo, 23. And Alessandro, 17. Great. Now, are they? Are they? They're living out in the country like you did. Do they want to get to the city and university? And? No, no, no. My wife, she's a very, you know, quite disappointed because they, they don't want to leave our house. You know? (laughs). (laughs). You're wife is Leticia? They don't want to leave the house. You're making it too easy for them. Gotta make them work harder. At the, at the winery, and uh, Marguerita, she's, she's doing the same. With a different position. And Alessandro is too young, you know, he's 17. No, he loves arts, he loves uh, museums, art collection, exposition, he's dream is to become an art critic. So, something very different. But why not, you know? (laughs). Well that's great. That's great. That's fantastic. How's that feel? It neat? Yeah, you know, I'm, I'm happy. Very happy. That's great. That's great. And also, so we've got, you're the chairman of the consortio for three, it's a three year term. Okay. So, quality will be getting even better. It's pretty good right now. Um, curious about your sales. How much percentage-wise do you sell in Italy? Of your wines? Yes. And uh, and the USA, of course, is number one. Market. And uh, Canada is growing very fast. Good. That's good to hear. That's a good problem to have, my friend. Congratulations. Are you? Are you traveling? How much do you travel? I travel only uh, you know, the wintertime. So, from now, after the harvest. From November to April. And then, with the start of growing season, I stop. And I, yeah, I stay home. I stay in the vineyards. Well, you, you have to because every year is different. Especially with the climate change. We, there is a, I, I used to say, you know, that is Mother Nature. That it's like playing with us. So, it's just to test if we are awake or not. And, so, sending us something new every year. Every year. So, just to check if we are waking, we are, we are sleeping or awake. That's good. I'm going to use that with Elias. Um, it's so true. And, you know, even after 30 or 35 years of making wine and growing grapes, you know, sometimes I, I almost, I start to say we've seen it all. And it's like I correct myself and say, um, we haven't seen it all. We've seen a lot. But, not everything because ... and it changes and, you'll, we've, I've noticed all of a sudden something with happen in May or June. It's like, uh-oh this is going on. This is going to affect it in September and August. We better start, we better get more water on. We better leaf. We better, you know, something. I mean, if you don't do it right then, in June, you're going to have a problem in September. Big problem. So, I'm glad you're not sleeping. No sleeping on the job. (laughs). Alright. Well, Giovanni, thank you so much for taking the time. You're a busy man. It's so great to see you. And uh, I appreciate you sharing your story with us. Thank you. Thank you very much and I hope to see you in Fontodi very soon. (laughs). I promise. Soon, soon. Thanks.